I gave this book a 5-star rating on Goodreads but I want to make it clear from the beginning: my rating of this book is not indicative of how I feel about Steve Jobs personally. From learning about him in this biography, I'd have to say he was a colossal jerk (I want to use stronger language here but since I'm a teacher, I'll continue to maintain my professionalism). My reasons for giving this biography such high praise then, is due to how engaging the narrative is. It is a fascinating look inside the mind of the man who created Apple and left me feeling conflicted. I want to dislike him intensely after reading about the terrible way he treated people. At the same time, he was more of an artist than a business man and while being an artist is no excuse for being a giant tool, it is common for artists to be temperamental. I think his appreciation for quality, beauty, and simplicity is what draws me more to Apple products than Microsoft. My husband is a PC guy; he's practical and very much a numbers person with little regard for how a product looks. Does it work and is it priced well are his criteria. So we have always owned PCs. But whenever I see Apple products in a store, I always look at them longingly and wish I owned a Mac instead of a PC. Much of this has to do with Jobs' regard for the look and simplicity of his products. This stems from Jobs' love for the arts and humanities rather than operating as a person with an all-business mindset. It is why, given the choice, I would own a Mac if our house weren't already so invested in PCs. It is why I now own an iPhone and will never own anything else as long as Apple is in the cell phone market. It is why, one of these days, I'm going to win the debate and own a Mac. Despite not liking him personally, what I admire most about Jobs is his desire to build quality products over making money. He has proved again and again that giving the customer what they want was never something he cared about. As he so aptly put, if Henry Ford had listened to what people wanted, they would've asked for a faster horse. What made Jobs such a genius was that he was able to create products that "the people" didn't even know they wanted until they saw it. This book holds nothing back and gives us a look inside his professional, family, and love life. Even though Jobs commissioned Isaacson to write this biography, he also knew that a biography about him would include unflattering details as well as exalting ones. However, it was more important to him that the narrative be honest than whether or not it made him look good. So by giving Isaacson unprecedented access to his life and the lives of the people he touched (whether positively or negatively), it was just another way for Jobs to maintain control. Still, knowing that Jobs approved of everything Isaacson would write helps the reader better settle into the writing and feel content with the accuracy of the narrative. The audiobook was narrated by Dylan Baker who has a very precise, no-nonsense, yet pleasant voice. I always judge the success of an audiobook based on how much I look forward to my work commute, and I'd have to say this one was right on the money. I'm actually kind of sad that I finished the book because I've enjoyed listening to Baker's voice so much. This book given an insight to the mind of a genius. It tells us that design matters in life and no detail is too small to ignore. Its a must read for someone who wants to be an entrepreneur. It deals with the notion of merging creativity with engineering. 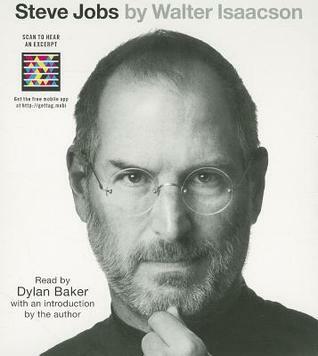 It describes how Apple was built and what it core values are. This book will definitely make us admire Apple and their designer engineers.